The Growing Earth/ Expanding Universe (GE/EU) paper presented at the CNPS-2016 Conference last July was recently revised. The corrected table below now indicates one orbital year always equals 31,557,600 linear seconds. Periodically, a “leap second” adjustment is made to align Earth’s orbital clock with the linear Atomic clock. Every “leap second” adjustment offers scientific evidence that Earth’s increasing mass is increasing Earth’s orbit. The above data indicates that leap second by leap second, the Earth leaped 75 million kilometers (46.6 million miles) in 175 million years. Theoretically, with a constant mass Sun, the Earth was half its radial size and half its radial distance 31,557,600 “leap seconds” ago. Mass increases on an Ionic Growing Earth are solely determined by 8 growing elements. Increasing the mass would proportionally increase the volume (radius and surface area) as well as the surface gravity. Changes in the Sun’s mass would only change the distance (R) and not Earth’s radius, gravity, or rotational velocity (spin). The previous GE /EU post indicates…. Every “leap second” adjustment offers scientific evidence that Earth’s increasing mass is increasing Earth’s orbit. .Elaborating…. a decrease in Earth’s rotational velocity (spin) would require an increase in Earth’s mass in accord with conserving angular momentum. The question then becomes…how much additional mass does the present leap second (LS) represent? 5.98 E+24 x 1.584404391 E-8 = 9.474738258 E+16 kg/yr for 1 LS / 2 yrs. Jack Hohner (Dynamic Matter) calculated a 5.68523302 E+16 kg/yr increase. The IGE-8 elements (Table 4R) calculates an average increase over the past 18.9 MY of 7.3084656 E+16 kg/yr [(5.98 E+24 – 4.5987 E+24) / 18.9 E+6]. The highlighted E+16 kg/yr numbers above are from 3 independent theorems on completely different mathematical pathways. One leap second ago, ~1.89 E+17 kg of Earth’s mass did not exist which translates to gaining over 3.3 million tons of new mass every second for the past two years. 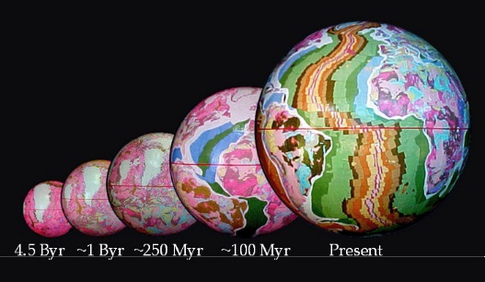 Around 175 MYA, 87.5% of Earth’s matter did not exist. The remaining question/problem involves uncovering the mechanism to accommodate this 8 fold increase. Conclusion: Leap seconds validate a Growing Earth / Expanding Universe. In my notes I record measurements of days per year from “coral” rings 400days at 400million years ago and 424days at 600 million years ago that appears to falsify the hypothesis set out above. Charles W. Lucas’s hypothesis presented in his “The Universal Force” Volume 1, published 2013 suggests that the matter in the Earth is not added but expands with the ageing of the components of the atoms. He believes that his equations show that the gravitational force was higher in the past because the matter was contained in a smaller volume. His equations are based on work by A. K. T. Assis using the slight unbalance of neutral atoms to explain the gravitational force. I think he has neglected to account for the increasing size of the atoms as they age. The gravitational force would thereby increase with time. As mass seems to be equated to gravitational force perhaps the concept of mass needs modifying to explain why momentum does not increase with increasing earth diameter. Lucas’s hypothesis has atoms losing energy and therefore mass. If the solar system has new bodies added from elsewhere from time to time perhaps the additional bodies are of atoms created at a different time and therefore of different mass. This suggests a simple undergraduate experiment to check mass of, say iron atoms, from meteorites to see if they differ. A microgram from each meteorite should be enough. Sorry, I didn’t see your comments until today. In measuring the distant past in days per year, one needs to formulate the number of days in an orbital year that are equal to the number of days in a linear year. In this regard, halving the spin (days per year) would double the number of days. These spin changes are necessary and required to maintain or conserve angular momentum. A hypothesis of elemental atoms losing mass, without tinkering with Newton’s gravity, would bring Earth closer to the Sun. An atom of an element is measured by its atomic weight and is the primary difference among the properties of the various elements. Iron does not change properties or becomes a different element if its weight is gained or lost. Increasing the volume of Earth without proportionally increasing the weight (mass) would change the planet’s density but not the distance between the Sun and the Earth. Time-wise, the increased volume (radius) always lags or follows behind the increased mass. The amount of mass controls the size of the radius. The Lagging Radius paper (at http://ionic-expanding-earth.weebly.com) uses 10 charts to show how the lag time affects both density and surface gravity. Toggling the keyboard arrows will incrementally shift the pages. The leap second should be enough to validate a growing Earth. I would suspect all iron began ageing when it ionized for the first time and became spectra visible some 2 BYA. Iron older than 2 billion years existed but, like all dark matter, couldn’t be found. You may have something with (atomic) weighing of iron from meteorites.